I’ve just had my first chance to experience the revived Don Muang International Airport, which now serves as Bangkok’s primary airport for low cost airlines. 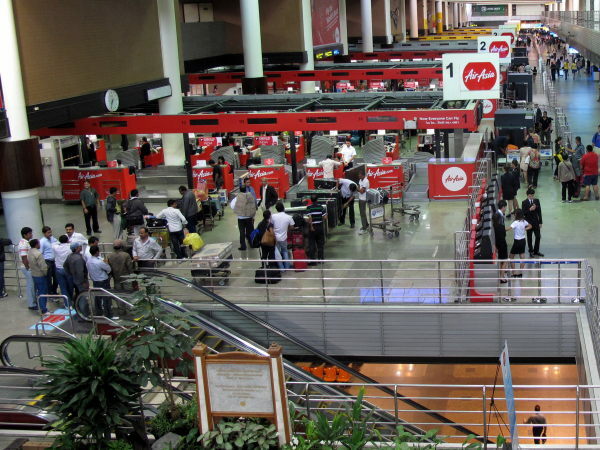 In October, the airport reopened the old international Terminal One to host all the airlines, which includes the country’s largest low-cost carrier, Air Asia, as well as Nok Air, Orient Thai and Solar Air. As you can see in the photo above, the old departure hall looks more or less the same. Aside from a few new walls here and there to divide domestic and international passengers and shut off the still-unused Terminal 2, there hasn’t been many changes to the old structure. Things are a bit different once you get through security into the departure area. On the whole, I’d have to rate the departure area as much better than the old domestic terminal at Don Muang, and even in many ways an improvement on the current domestic wings of Suvarnabhumi. There’s quite a few food options, from Burger King and Subway to Starbucks and Krispy Kreme (which still seems to be popular with Thais). There are a few cheap options as well as some no-name local places. You’ll also find convenience stores, boutiques, kid’s play areas and lots of room to just sit and wait. The one thing really missing is any kind of public wi-fi. This is a quick trip, and I’ll be back on Friday to see how arrivals looks. The one key question is taxi availability, since it was a problem before. We’ll see how I fare then. Update: On returning, there really wasn’t a problem at all with taxis, except that the queue to get one was rather long. It moves along rather quickly, so don’t get discouraged. The main holdup is usually tourists who don’t know where they’re going, or don’t know what to do once they get the queue slip. Also, don’t try to negotiate the fare with the person at the desk; you pay what’s on the meter, period, and they can’t help you.